Travel to the end of the world and explore the Antarctic wilderness with a thrilling Antarctica cruise. For many travelers, this desolated yet strikingly beautiful land is a dream of a lifetime. With this unique 20-day Antarctica cruise departing from Ushuaia, the immense Antarctica region is right at your fingertips. Enjoy the comfort of your modern cruise ship as breathtaking glacial landscapes unfold before your eyes. Devoid of inhabitants and infrastructure, this territory which belongs to no one, is a haven for the few wild species that have managed to adapt to the harsh weather conditions. Among these you’ll find gigantic colonies of thousands of penguins inhabiting the various rookeries Explore this stunning area with a cruise that will take you to the most breathtaking spots where, once the engines are turned off, only silence can be heard, with the occasional boom of icebergs calving. Enjoy a filling breakfast at your hotel before meeting your guide for an exciting tour of the magnificent Tierra del Fuego National Park where you’ll be able to hike some of the many trails. After the tour, you’ll be treated to a traditional Argentine meal of asado barbecue consisting of lamb, beef, and chicken cooked over an open fire. You will then be taken to the dock to board your comfortable Antarctica cruise ship. You’ll begin the cruise sailing across the stunning Beagle Channel, where you can observe a plethora of wildlife, including penguins, cormorants, petrels, and black-browed Albatross. Wake up aboard your ship and enjoy a day learning about these fascinating lands with the expert ornithologists, marine biologists, historians, and geologists that accompany you on the cruise. There will be various informative presentations on board to prepare you for what you’ll get to see during your shore excursions. For the next two days, you’ll explore the beautiful Falkland Islands, known as Las Islas Malvinas in Spanish, part of the Argentinean territory. You’ll have the chance to disembark and discover the islands, hiking the rocky beaches and mingling with the friendly locals who’ll gladly tell you about the islands’ interesting history. The islands are teeming with bird life, including the Kelp Geese, and as well as both the Rockhopper and Magellanic penguins. After each land excursion, you’ll be taken back to your cruise ship for the night. For the next two days, you’ll continue your journey toward South Georgia, your first stop in the Antarctica region. Both days will be filled with interesting presentations to help you prepare for the next land excursions and zodiac cruises in South Georgia. You’ll enter Antarctic waters when you cross the “Antarctic Convergence,” the biological boundary where cold Antarctic waters meet warmer waters of the sub-Antarctic. On the 8th day of your cruise, you’ll catch your first glimpse of the breathtaking snow-capped South Georgia, lined with awe-inspiring jagged peaks. For the next 4 days, you’ll be able to disembark your ship and ride on zodiac boats to the shore for exciting explorations of the Antarctic landscape. On shore, you’ll be surrounded by colonies of penguins and seals. Your zodiac boat will land at several King Penguin Rookeries, abandoned whaling stations, and the isolated gravesite of famous explorer Sir Ernest Shackleton. You may also be able to spot Albatross and Giant Petrels, as well as reindeer, which were introduced to Antarctica by Norwegian whalers in the early 20th century. Among the many activities you’ll be able to partake in are hiking on the rocky beaches, sailing in zodiacs alongside the shore, visiting a whaling museum, and kayaking in stunning icy bays. Your will leave South Georgia as your cruise ship continues its journey south, toward the Antarctic Peninsula. You’ll be able to enjoy more presentations with the experts on board before you reach the Shetland Islands and Antarctic Peninsula, the next stop on your Antarctica cruise. During these days you’ll explore the islands and the tip of the Antarctic Peninsula. Depending on the weather conditions, which are ever changing in this remote area of the world, you’ll enjoy various activities in the striking Antarctic Peninsula. You will have the chance to explore stunning pebbled beaches teeming with colonies of penguins, plunge in the polar, icy waters of Paradise Bay, kayak among gigantic whales and barking fur seals, mountaineer on icy inclines, or cruise across awe-inspiring glaciers. The sight of calving glaciers and infinite glacial landscapes throughout your explorations is to behold. 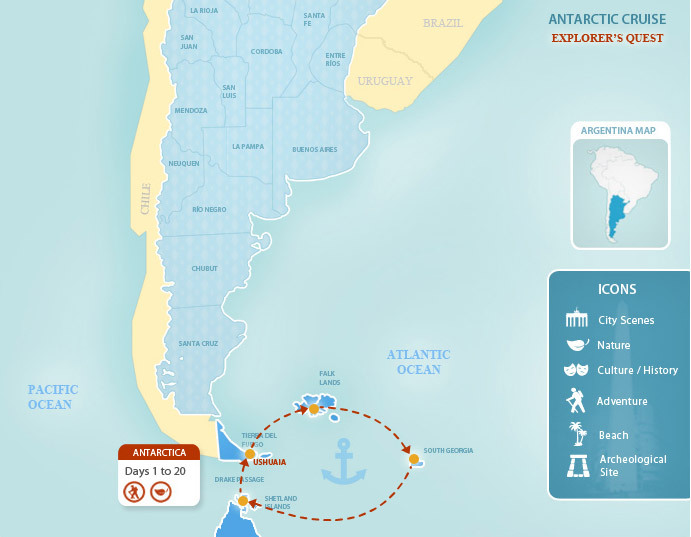 Once you’ve had your fill of the many wonders offered by the Antarctica, you will depart on the journey back to Argentina, crossing the famous Drake Passage on the way. This 500-mile wide passage separates the northern tip of the Antarctic continent from the bottom part of South America, and is known for its rough waters. Your thrilling Antarctica cruise ends today as you reach the port of Ushuaia, where you’ll say final goodbyes to the crew and your fellow travelers before disembarking.